Home Costs > How Much Does it Cost to Fill a Propane Tank? How Much Does it Cost to Fill a Propane Tank? There are two ways to get more propane. One way is to refill the tank and the other way is to exchange it for a new one. While there are perks to both, many people opt to refill a propane tank to help save on costs. The average cost to refill a propane tank will depend on the size of the tank and the retailer you use. On average, refilling a 10-pound tank is going to cost anywhere from $9 to $22 per tank. A 20-pound tank can cost upwards of $15 to $30 per tank to refill. We researched popular retailers in our area and listed the average refill price in our table below. A 100-pound tank can cost upwards of $65 to as much as $80. Something even larger, such as a 500-gallon propane tank, will depend on the market conditions. Most of the time, this rate will be in the $2.50 per gallon range, plus the delivery fee. For example, Blue Rhino and Amerigas, a brand you commonly see at most big-box retailers, generally charge around $22, plus tax at their stations, while a name-brand retailer such as Tractor Supply Plus charges around $17 plus tax to fill up a tank. NOTE: These prices can be different depending on your geographical location. Most retailers will have a cage filled with new tanks located in the front of the store. Some may have a self-serve kiosk, while others require you get an associate to help you exchange or purchase a new tank. Some retailers such as Tractor Supply Plus allow you to keep your tank as they will fill your tank on site and only charge you for the amount of propane you purchased. Some retailers can often offer a 30-day guarantee. If any problems persist during this time, you will be able to bring back your propane tank and either get a new one or get your money back. NEVER attempt to refill a propane tank on your own. While there are tutorials on the internet, the risk is not worth saving $15. You could potentially cause a lot of harm, sometimes even death if you were to do something wrong. If you were to exchange a propane tank, keep in mind that most of the time, you won’t get 20 pounds of propane in a 20-pound tank. 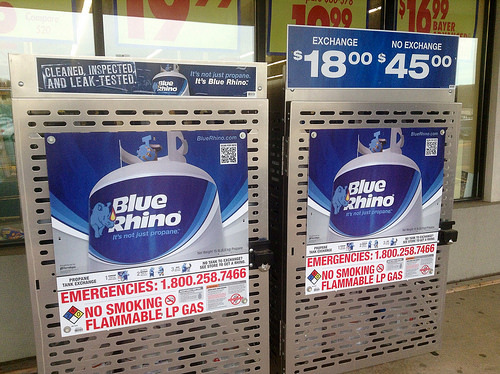 Even according to Blue Rhino’s official website, they only contain 15 pounds, which equates to 3.6 gallons of fuel. According to Home Depot, they claim their propane tanks are filled to an 80 percent capacity. A tank exchange will always be the cheapest option and most of your gas stations and retailers will have tank exchange options. However, if you can, try to find a retailer that refills your tank on the spot, offering you only the amount of propane you truly need. Refilling, according to elivermore.com, will give you a full capacity, unlike an exchange service that only gives you 15 pounds. To make the most out of your propane tank, consider a propane tank gauge to determine how much propane is left in your tank. Plus, you can bring this gauge to the store to make sure you’re getting a full tank. If you plan on going to a big box retailer, such as Lowe’s or Home Depot, consider looking for a coupon ahead of time to see if you can save a few extra dollars. Also, Blue Rhino, the brand we mentioned earlier, often has coupons available on its official website. WE PAID $100.00 FOR 100 GALLONS OF PROPANE.